For decades, the sleepy fishing village of Chimera Cove has harboured a dangerous secret. Deep beneath the cove's three islands, a secret pirate complex hides a weapon that terrorized the local shipping lanes before a brave privateer finally locked it away. Now the last degenerate scion of his line is breaking into the secret tunnels, intent on selling the devastating weapon to the highest bidder. With time slipping away, only the PCs are equipped to brave the underground vault and ensure that the lost weapon stays that way. 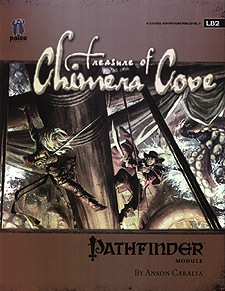 Treasure of Chimera Cove is a seafaring dungeon crawl adventure for 7th-level characters, compatible with the 3.5 edition of the world's most popular roleplaying game. Within its pages you'll find a detailed overview of the privateer's tunnels beneath the islands, a new monster template filled with aquatic undead horror, and the terrible ship-crushing weapon known as the Terraken. This adventure is set on the border between two nations in the Pathfinder Chronicles campaign setting, but can easily be set in any game world. It can be used on its own or combined with its prequel, Tower of the Last Baron, to create an even greater campaign arc.